Credit/debit/eftpos cards, ID card, drivers license, reward cards, business cards, cash - safe on your keyring. Ever need to hop in the car to get the kids from school, don't need your whole bag, but do need your drivers license? Ever put your D/L in your pocket, then next time you take your bag, you forget to put it back? Ever had a spate of bag snatching at your local mall? Ever gone to a rock concert and a handbag is not what you what hanging off your arm? I can answer a resounding "yes" to all of these questions, and I designed this little number to fit my needs. 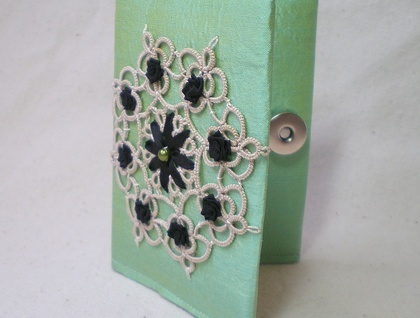 This one is pieced with a gorgeous light green silk dupion and embellished with vintage tatting and black silk ribbon embroidery. 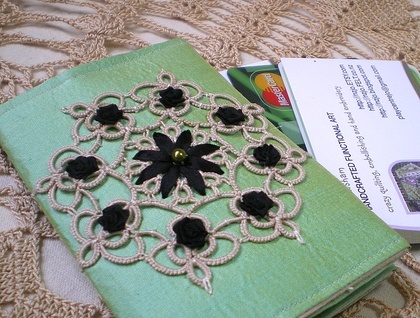 This holder is lined with calico. 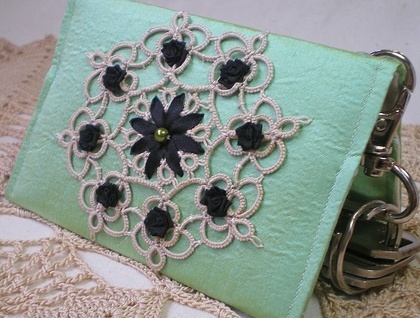 Each embroidery is unique, and will not be repeated. Measuring approx 2.6x4in/6.5x10cm ,it attaches to your keyring via a metal eyelet. It will fit in your pocket , or on a lanyard. Both the lining and the front are reinforced with fusible interfacing, which add stability and durability to the pouch. There are no raw edges. 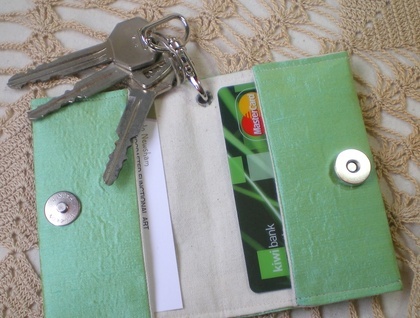 The card holder closes with a magnetic snap. I could comfortably fit 10(plastic) cards and 10 business cards in this, and there was still room . Some cash will slot safely in here too. Not suitable for coins.